Luego de seguir parte de los premios por facebook, dieron los resultados. En pinterest pueden encontrar buen material y en el grupo de linkedin, ehhhh también! We’ve been at this social game for a while now, you and me. We saw it grow up from a minor phenomenon to a mainstream communication channel. And we were there for the emergence of “pinning” (no longer just a wrestling term), the broad use of Twitter in crisis reporting, and seemingly countless redesigns of the Facebook Wall, err … Timeline. In such a rapidly changing space, it’s hard not to get pulled into an ongoing analysis of where we are, where we’ve been, and where we’re headed next. In this most recent round of reassessment, a handful of trends have caught my attention. And, unlike the loss of LinkedIn Answers, I’m feeling pretty good about them. So let’s take a closer look at how social media is changing … for the better. Social media has always enjoyed firm footing as a marketing and communications tool. But more and more, sales teams are finding ways to incorporate it into their sales processes; and those that do are seeing some pretty impressive results. In a talk with HubSpot the other day, Kurlan and Associates’ Vice President and self-proclaimed “reformed salesman” Frank Belzer noted that he dedicates time each day to content creation and social media. “Sales should help with content and build a reputation for thought leadership,” Belzer advises. He explained that content creation and social media outreach should be incorporated into bonus structures and sales schedules, and followed up with a story about a lead who, after months of avoiding sales calls, finally converted after Belzer left a thoughtful and relevant comment on the lead’s blog post. Responding to a question in social media recently not only led Kissmetrics founder Hiten Shah to land a deal for his company; it also landed him some great praise on the customer’s blog. Set up alerts and monitoring: Hiten Shah didn’t just happen upon Stella’s question; he likely has social media monitoring and alerts set up to notify him of relevant conversations happening around his company’s and industry’s keywords in social media. Keep it useful and ‘inbound’: Treat social like an outbound promotion channel and you’ll end up alienating your audience. Instead, set time aside to thoughtfully respond to questions or share helpful content. Pull social media intelligence into your sales calls: Before calling up leads, make sure you’re aware of the content your leads are sharing on sites like Twitter or LinkedIn. Using a tool like HubSpot’s Social Contacts, your salespeople can go into their calls equipped with information about what leads have found interesting, and how often they’ve clicked on your social shares. Learn more about how Sales can use Twitter to connect with more prospects in this article. Marketing platforms like HubSpot were built to integrate all of your marketing channels into one seamless view, from email to website to social media — and beyond. Using a single software platform to manage each of your channels reduces communication gaps and enables you to see how each channel is contributing to your bottom line. Make sure your entire team is actively listening to prospects and customers in social media. Establish a standard practice for how inquiries via social are answered and what internal notification needs to take place as a result of each interaction. In the beginning, “engagement” was all the rage. Other channels couldn’t quite attain the level of engagement social media could, and in the absence of any other metrics, engagement became the primary way marketers evaluated their success on social. Today, things are much, much different. Technology has caught up with marketers’ need for a sharper way to gauge ROI, and many companies are beginning to evolve from measuring more superficial social media metrics like clicks, retweets, and Likes to tracking metrics that are tied more closely to a company’s bottom line. Made possible by integrating social tools with a contacts database or a CRM and sharing data across platforms, companies like HubSpot customer Votility, an online advocacy software, have been able to refocus their strategy on leads generated through social media. Sarah Papachristos, social media manager at Great Island Technologies who worked with Votility on the effort, recently walked us through how they did it. After refocusing their strategy on leads in addition to engagement metrics, Great Island increased their leads generated through social media by 650%. And today, nearly 1 out of every 10 visitors that comes from LinkedIn becomes a lead for Great Island. “Social search” is an evolving term for the way search engines are factoring content from a user’s social network into the results they get for their search queries. Marketers started taking note of social search with the development of Google+ and the launch of Bing’s social search engine last summer. But the social search trend has continued to get more and more attention from search engines. Last week, Facebook joined the ranks by announcing Graph Search, a search engine that uses social signals to elevate more relevant, personalized results. Just days after that announcement, we also learned about Bing’s initiative to add 5x more Facebook content to its search results. Author tags will help your content to stand out in Google’s search results. To start using Google’s author tag, check out our Google Authorship setup guide. Because social search inherently prioritizes content that has been shared by others, it’s important to understand who is currently sharing your content and find ways to encourage that behavior. Make sure you are thanking your social media evangelists and similarly sharing their content, too. 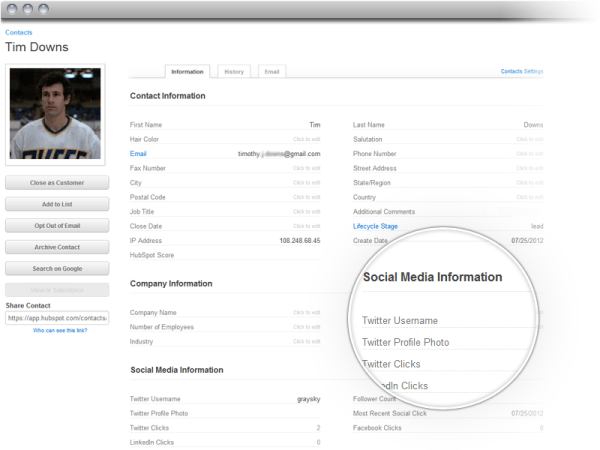 As we mentioned earlier, tools that integrate social behavior with your contacts database can make this much easier. Pinterest, Instagram, Tumblr … you’re hearing these names pretty often these days, right? For good reason. According to comScore, Pinterest buyers spend more money, more often, and on more items than any of the other top five social media sites. While visual content got a head start in ecommerce and B2C companies, its effects are now spanning across industries. Pinterest in particular has started to encourage companies to leverage its platform. In November, it introduced business accounts and added a slew of new services to help you drive traffic to your website. When it comes to optimizing your marketing strategy for visual discovery engines like Pinterest, it helps to start using clear, compelling images in your content. And this also extends to social sites like Facebook and Google+, which are also displaying images more prominently than ever before. In fact, a recent HubSpot study showed that photos on Facebook generate 53% more Likes than the average post. According to Nielsen, time spent on mobile apps and the mobile web account for 63% of the year-over-year growth in overall time spent using social media. Mobile is rapidly becoming the primary way we consume and interact with social (and nearly all) content. As a result, we’re starting to see companies regard mobile as a primary communication channel. From optimizing their content for mobile devices to encouraging the use of mobile for things like live tweeting and geotagging, companies are starting to keep their eye out for ways mobile can enable better content consumption. It’s about the whole experience. While your Facebook shares and tweets may be easily consumed on mobile, what happens when a mobile user clicks through to the content you shared? Is it easily readable? If there’s a form, is it plausible that a mobile user could complete it? You don’t need to have all the answers right away, but keep a look out for ways your company can create a better experience for mobile users. So … who’s excited? The pace of change in social media can make your head spin sometimes, but that’s exactly what makes it such a forward-leaning marketing channel. Help us out — what changes are underway for your own social media strategies that I haven’t included here? What do you think will be the biggest opportunity or challenge in social media marketing this year? Los avances en tecnología llevan condicionando la educación recibida en las aulas desde hace más de 25 años. A medida que el sistema educativo adopta las nuevas tecnologías, el resultado final de “qué aprendemos y cómo lo aprendemos” está cambiando. Muchos pedagogos y docentes son reacios a la idea de cambiar la forma de aprendizaje recibida hasta hace poco – otros muchos tratan de impulsarla – pero, quieran o no, el cambio es inevitable. Sin ir más lejos, hace 15 años, cuando teníamos que hacer un trabajo o buscar información para un proyecto nos pasábamos horas en la biblioteca inmersos entre libros. Hoy en día los alumnos lo hacen desde el sofá de su casa gracias un ordenador o tablet e internet, pero ¿qué pasa entre las cuatro paredes de un colegio? Las generaciones actuales son nativas digitales pero aún así el cambio en las aulas es lento. ¿Qué sucederá en los próximos años en un contexto de exponencialidad en los cambios? Vamos a hacer un ejercicio de imaginación. En este post trataremos de analizar el futuro de la educación, influenciado por la adopción tecnológica a partir de un estudio desarrollado por Invisioning Technology en el que se identifican seis tendencias clave que enlazan y contextualizan dichas tecnologías, incluyendo la digitalización de las aulas, gamification y la desintermediación. Actualmente la tecnología es fija y está centralizada, ya sea en un laboratorio de ordenadores o en el aula. A pesar de muchos avances tecnológicos y la introducción de nuevos conceptos pedagógicos, la mayoría de los colegios continúan utilizando el método tradicional. Sí, es verdad que han incorporado algunos avances tecnológicos en las aulas como pueden ser proyectores, tablets o pizarras digitales interactivas. Pero en lugar de considerarlo una herramienta independiente o una habilidad, la digitalización se dispersará a lo largo de todas las facetas del aprendizaje. Existe un uso ubicuo de la tecnología móvil. Anunciado como una evolución en los mecanismos calificación, la gamification aplicacada a la educación trae una retribución instantánea a los conocimientos adquiridos a través de los logros y los sistemas de puntos. Hoy en día ya existen apps desarrolladas por y para estudiantes, juegos educativos, herramientas educativas de programación. Básicamente cada estudiante sigue su propio ritmo de aprendizaje ya que la información es abierta y de fácil alcance para todos. Los estudiantes están tomando, cada vez más, responsabilidad por su propio aprendizaje y los profesores están trabajando más como mentores y menos como presentadores de información. A medida que se digitalizan las aulas, los estudiantes tienen la libertad de colaborar con sus compañeros a nivel mundial. La conectividad que nos proporciona internet está teniendo y tendrá un profundo impacto en los mecanismos de aprendizaje durante los próximos 20 años. La explosión de información disponible amplía nuestra visión del mundo y nos crea la necesidad de estar conectados constantemente. Se estima que en la próxima década las aulas estarán equipadas con pantallas digitales en la mesas, pantallas digitales interactivas, excursiones digitalmente intermediadas, materiales que reaccionen a la interacción, etc. Básicamente las pizarras de tiza, los libros de papel y las aulas con 20 alumnos serán cosa del pasado. La enseñanza se convertirá en proyecto basado en el rendimiento y en una cartera de valores en lugar de las evaluaciones y calificaciones tradicionales. Con el tiempo, la educación reglada se convertirá en un esfuerzo continuo e interconectado, permitiendo a los estudiantes hacer frente a un mundo en perpetuo cambio. Se llenará el vacío entre lo online y lo offline. Estas futuras tecnologías ofrecerán un porvenir potencial donde la presencia física será secundaria al acceso a la información. La enseñanza estará apoyada por pantallas de retina, neuro-informática, profesores holográficos y un mundo en el que los alumnos estén inmersos en una realidad virtual. En definitiva, una visión optimista de un mundo que, como siempre, sigue cambiando. Durante los próximos años asistiremos (ya lo estamos haciendo) a profundos cambios en los hábitos de las personas. Cambios que nacen ya en las aulas y que parecen inevitables – y generalmente positivos – en un mundo en el que se estima que el 65% de los alumnos de primaria de hoy en día desempeñarán puestos de trabajo que aún no se han inventado. Existe un reto profundo, la e-inclusion, pero ese ya es otro post.